1928 RKO (Radio-Keith-Orpheum) Pictures, evolving originally from the Mutual Film Corporation (1912), was created in the merger of the Radio Corporation of America (RCA), the Film Booking Office (FBO) and Keith-Albee-Orpheum, a major Vaudeville corporation. It was established as a subsidiary of RCA and joined the ranks of the major Hollywood studios. 1928 Director Roy William Neill's The Viking (1928) was the first feature-length Technicolor film that featured a soundtrack, and the first film made in Technicolor's Process 3. 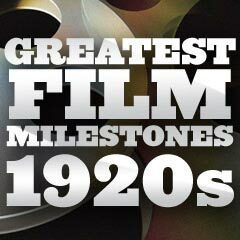 1928 By 1928, Hollywood's major film studios had signed an agreement with AT&T/Western Electric's licensing division (ERPI, or Electrical Research Products, Inc.) to use their audio technologies to produce films with sound. They proceeded with the conversion of production facilities and theaters for sound film. This led to an explosion in the popularity of sound in cinema. 1928 The first 'Mickey Mouse' short animated film, Plane Crazy (1928), was debuted on May 15, 1928. The character of an animated mouse (future Mickey Mouse) was modified from Disney's earlier character Oswald the Lucky Rabbit, which was introduced in 1927. 1928 The first all-talking cartoon short, Paul Terry's Dinner Time (1928) with synchronized sound was premiered, preceding Disney's Steamboat Willie (1928) by about a month. It was made after Warner Bros.' success with The Jazz Singer (1927). 1928 Walt Disney also introduced the first popular animated cartoons with synchronized sound later in this year: Steamboat Willie (on July 29, 1928, in limited release) and Galloping Gaucho (on August 2, 1928). Steamboat Willie - Mickey's first sound cartoon, was then re-released on November 18, 1928 with sound and premiered at the 79th Street Colony Theatre in New York - it was Disney's first cartoon with a post-produced synchronized soundtrack (of music, dialogue, and sound effects) and was considered Mickey Mouse's (and Minnie's) screen debut performance and birthdate. It was the first sound cartoon that was a major hit. Walt Disney provided the voice for Mickey until his death. 1928 The Best Picture-nominated western film In Old Arizona (1928), made by directors Raoul Walsh and Irving Cummings, was released. It was the first full-length talkie film to be shot outdoors (on location) and not in a studio, as well as the first sound western film. 1928 The gangster melodrama The Lights of New York (1928) by director Bryan Foy was released by Warner Brothers as the first 100% all-talking feature film, as a result of the phenomenal success of The Jazz Singer (1927) that had just a few minutes of sound. This first Warner Bros. gangster film was unexpectedly successful, grossing over $2 million. 1928 Warner Brothers' second 'all-talking' picture was The Terror (1928) - director Roy Del Ruth's adaptation of Edgar Wallace's play regarding a haunted house terrorized by a homicidal asylum escapee. The film's many ads capitalized on the new feature of sound (creaking doors, howling winds, organ music), heard with the Vitaphone sound-on-disc process: "It will thrill you! Grip you! Set you into tremors of awe. HEAR this creepy tale of mystery - the baffling story of a detective's great triumph. With voices and shadows that will rack your nerves and make you like it. Come, hear them talk in this Vitaphone production of the play that has gripped London for over 3 years." 1928 Danish director Carl Theodor Dreyer's startling and influential The Passion of Joan of Arc (1928) used minimal sets, extremely oblique and other unusual camera angles, and excruciatingly huge close-ups to create a virtually new visual language soulfully expressive of the martyr's (Maria Falconetti) suffering psychology. 1928 Future star John Wayne (a former prop man) has often been credited as making his debut feature film appearance as an unbilled extra in director John Ford's melodrama Mother Machree (1928). But Wayne had already appeared as uncredited extras or bit players in films dating back to 1926, including Brown of Harvard (1926), Bardelys the Magnificent (1926), The Great K & A Train Robbery (1926), Annie Laurie (1927), and The Drop Kick (1927). 1928 Paramount became the first studio to announce that it would only produce "talkies." 1928 Ernst Lubitsch's and Paramount's dramatic silent film The Patriot (1928), a "lost film," was the only silent film nominated for the Best Picture Academy Award in 1928. It was the last silent movie to receive a Best Picture nomination (unless one counted the mostly-silent The Artist (2011) which won in 2012). Only minor excerpts or portions of the film exist - thereby making it the only Best Picture Oscar-nominee to exist in incomplete form. From its five Academy Award nominations (including Best Actor, Best Art Direction, Best Director, and Best Picture), it won only Best Writing Achievement. Its budget was enormous, estimated to be $1 million. It featured a sychronized music score with orchestral accompaniment - added during post-production. German actor Emil Jannings starred in the semi-biopic as mad despot Czar Paul I. 1928 Warners' follow-up film and melodramatic musical, The Singing Fool (1928), was released in both sound and silent versions. It contained the first hit song from a talking movie soundtrack - Al Jolson's performance of Sonny Boy. 1928 MGM's first sound film (although it was part silent and part talkie) was director W.S. Van Dyke's epic adventure/romantic drama White Shadows in the South Seas (1928) - and it was also the first instance in which audiences heard MGM's logo/mascot Leo the Lion roar during the opening credits. 1928 Director Germaine Dulac released the classic The Seashell and the Clergyman) (1928, Fr.) (aka La Coquille et Le Clergyman), the first surrealist film, although many have claimed Un Chien Andalou (1929) by Luis Bunuel (and Salvador Dali) a year later was the first. The latter film, filled with irrational and shocking images, opened with the infamous scene of the slashing of a woman's eyeball with a razor blade. 1928 The first reported example of the use of "freeze-frame" (a special effect camera shot or optical technique that halts the action on a single frame of film, giving the impression of a still photo) was in director Alfred Hitchcock's early British comedy film, Champagne (1928, UK). In the shot, a group of dancers on a cruise ship were freeze-framed, then as the image pulled back, it transitioned to become a framed picture labeled: "NEW YEARS EVE AQUITANIA." 1928 Broadway stage actor Humphrey Bogart had his film debut - and his first leading film role, opposite Helen Hayes, in the two-reel short The Dancing Town (1928). His success soon led to a film contract with the Fox Film Corporation.